Option MO3 loop powered local display is designed for quick set-up in direct read-out of milli-Amps DC, percent of full scale or in engineering units. The display can be configured from -1999 to +1999. The M03 is manufactured for reliability in aggressive environments where other indicators fail. The high impact ABS plastic housing is fully gasketed and is rated NEMA 4X. State-of-art surface mount electronics are mounted to ensure safe and reliable operation even in high vibration applications. The M03 is available for Dylix’s gage, absolute and differential products where a DIN 43650 A (Option Code: B11) can be mounted. Calibration to specific customer requirements in mAdc or engineering units is at no-charge. Every transmitter with option M03 is shipped with a NIST traceable calibration certificate. 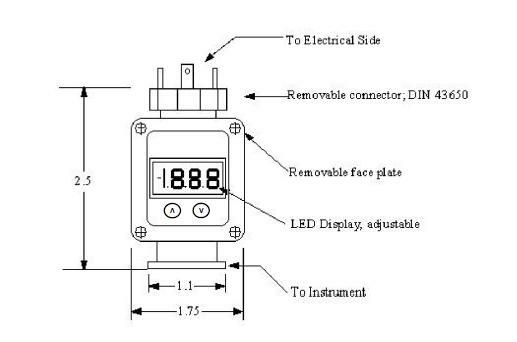 The calibration certificate includes the 4-20 mA output of the pressure instrument as well as the system calibration of pressure instrument and display.